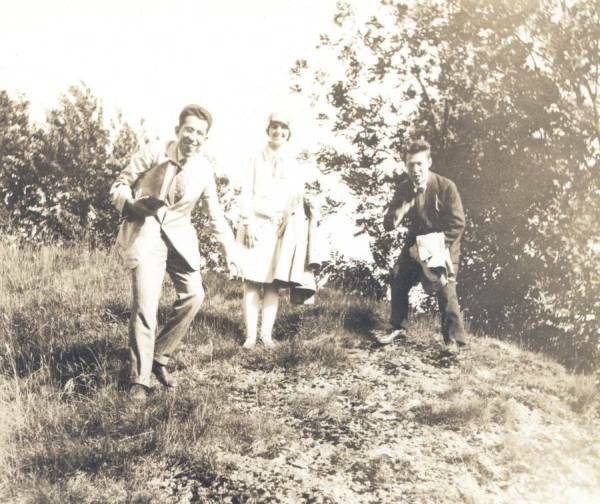 Linus and Ava Helen Pauling in Munich, with Walter Heitler (left) and Fritz London (right), 1927. In 1928 the German physicists Walter Heitler and Fritz London published a paper that appeared to have beaten Linus Pauling to the punch in its application of quantum mechanics to the theory of chemical bonding. As with Pauling, the duo was interested in Erwin Schrödinger’s wave function, and in their paper they applied it to the simplest bond: that formed by two hydrogen atoms. In so doing, Heitler and London did indeed become the first scientists to publish an application of this type. The German colleagues also incorporated Werner Heisenberg’s ideas on exchange energy. Heisenberg had theorized that the electrons of two given atoms would find themselves attracted to the positively charged nuclei of their atomic pairs. As such, a chemical bond, according to this theory, consisted simply of two electrons jumping back and forth between two atoms, belonging simultaneously to both and to neither. Heitler and London extended this idea, proposing that chemical bonds sourced their lengths and strengths from the amount of repulsion extant between two positively charged nuclei. The balance between the electrons’ attraction to these nuclei, coupled with the quantifiable repulsion existing between the two nuclei, ultimately served to create the bond. Pauling on the precipice of greatness, 1928. Invigorated by the promise of competition, Pauling set to work applying Heitler and London’s theory to more complex molecules. In part to motivate himself, but also to ensure that he received recognition for his research, Pauling announced in the Proceedings of the National Academy of Sciences that he believed he could solve the tetrahedral binding of carbon using the ideas put forth by quantum mechanics. This declaration piqued significant interest throughout the scientific community, striking a nerve for chemists and physicists alike, both groups of whom had been puzzling over this specific structure in different ways. On one hand, physicists believed that carbon should have a valence of two because, of its six electrons, four were located in two different subshells. Both sets of two would then be expected to pair off with each other, leaving only two electrons logically available for bonding. On the other hand, chemists found in the laboratory that carbon typically offered four electrons for bonding in nature. In essence, both theory and experiment indicated that neither party was completely right, but so too could neither point of view be completely wrong. Pauling believed that quantum mechanics could illuminate the paradox. Agreement on a limited number of points cannot be accepted as verification of the hypothesis. In order for the stochastic method to be significant, the principles used in formulating the hypothesis must be restrictive enough to make the hypothesis itself essentially unique. In other words, Pauling was relying on his knowledge of chemical principles to develop meticulous and educated hypotheses that he could go back and prove. And as he would hasten to add, he placed very little stock in luck or guesswork. As work moved forward, Pauling added his rules to three others that had been established by G.N. Lewis – and then expanded and formalized by Heitler and London – concerning the electron pair bond. These rules set parameters for the circumstances in which an electron would be theoretically available to form a chemical bond. Though equipped with a solid toolkit of his and others’ making, it ultimately took Pauling almost three years to solve the carbon tetrahedron, with his big breakthrough coming in December of 1930. Inspired by the work of MIT physicist John C. Slater, Pauling found a way to reduce the complexity of the radial wave function, a component of bond orbital theory the application of which had been giving him some trouble. With this solution in hand, the math required for solving further steps of the carbon puzzle became significantly more manageable. Pauling’s subsequent equations led him to develop a model for the structure that consisted of four equal orbitals oriented at the angles of a tetrahedron. Using these equations, Pauling further discerned that the strength of the bonds within the structure increased in accordance with greater degrees of orbital overlap between two atoms. The overlap, Pauling found, produced more exchange energy and this in turn created a stronger bond. Pauling sent his paper to the Journal of the American Chemical Society (JACS) in February 1931. In it, Pauling detailed three rules governing eigenfunctions that complemented G.N. Lewis’ rules about electron pairs. Pauling used this collection of guidelines to explain relative bond strength, finding that the strongest bonds occurred on the lowest energy level and where orbitals overlap. He also developed a complete theory of magnetic moments and ended the paper stressing the important role that quantum mechanics had played in his formulation of the rules and theories expressed in the work. The paper, titled “The Nature of the Chemical Bond: Application of Results Obtained from the Quantum Mechanics and from a Theory of Paramagnetic Susceptibility to the Structure of Molecules,” was accepted and published in record time. The subject matter was so new and the ideas so fresh that Arthur Lamb, the editor of JACS at the time, had trouble finding a group qualified enough to review it. Even so, he scheduled the article for the April issue and in so doing published Pauling’s paper a mere six weeks after he had received it. In 1926, whether he knew it or not, Linus Pauling embarked down a path toward the transformation of chemistry and the way that it would be studied for generations to come. The ideas that he began developing during this time gradually became the standard model for those studying chemistry while simultaneously launching Pauling to dizzying heights. His April 1931 paper, the first in a series of seven, also became the basis for his 1939 book, The Nature of the Chemical Bond, which was almost immediately recognized as a classic of twentieth-century scientific writing. 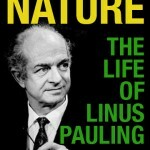 One of the major film documentaries chronicling Linus Pauling’s life was produced for the long-running NOVA series in 1977. By that point, when asked to look back over the decades of significant work that he had done, Pauling still singled out his insights into the chemical bond as being his most significant contribution to chemistry. 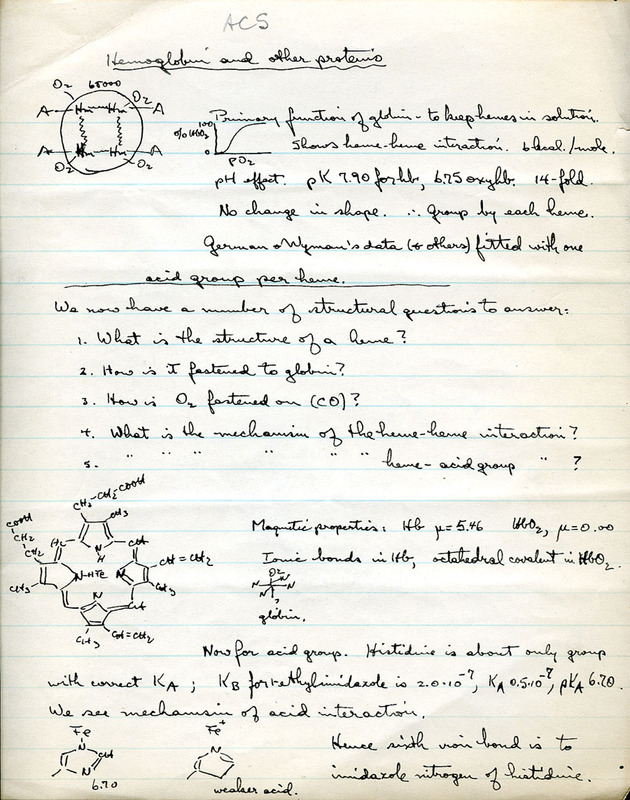 Pauling’s initial 1931 paper in particular marked the first time that he published his revolutionary point of view related to the chemical bond, and reflecting on that period Pauling went so far as to call the article “the best work I’ve ever done.” Indeed, the paper marked the first instance in which Pauling began to spell out the ways in which the burgeoning field of quantum mechanics might be applied to fundamental questions in chemistry. And though first in a lengthy series, Pauling placed major significance on this one paper because it profoundly changed the course of his career and set into motion a period of heavy influenced on the trajectory of an entire discipline. While an undergraduate at Oregon Agricultural College, Pauling had been taught – and went on to teach his own students – the “hooks and eyes” theory of chemical bonding. In this model, each atom was presumed to have a certain number of hooks or eyes that determined how and to what other atoms it could connect. Though it prevailed at the time, the model was deemed to be outdated and insufficient by many of Pauling’s contemporaries, some of whom were concurrently searching for a more satisfactory replacement. That said, “hooks and eyes” did serve as a useful precursor to the later concept of valence, because it correctly assumed that each atom possessed a concrete number of electrons to contribute to the formation of bonds with other atoms. The theory also suggested that there were rules governing how chemical bonds worked and how likely it was that two or more atoms might form a bond. While Pauling was still a student in Oregon, he avidly read G.N. Lewis’ ideas about electron structure and also studied Irving Langmuir’s theory of valence, a tutelage that helped propel his own nascent interest in chemical bonding and atomic structure. Lewis proved to be particularly important. A chemist at the University of California, Berkeley and a future mentor of Pauling’s, Lewis proposed that eight electrons provided a maximally stable environment for a molecule, a tenet known today as the octet rule. Working from this idea, Lewis hypothesized that an atom containing, for example, seven electrons would bond more readily with an atom containing nine electrons, and that the bond that was formed consisted of the electron shared between the two atoms. Lewis wasn’t the first to chase the nature of the chemical bond. Indeed, the problem had been under attack for a few decades. In 1911, Ernest Rutherford created the first modern atomic model, but ran into trouble because it wasn’t compatible with classical physics. Niels Bohr then updated this model. Less than twenty years after J. J. Thompson had discovered the electron, Bohr suggested that electrons orbited the nucleus in a predictable way, emitting quanta when they moved into lower orbits. From there, others sought to fill gaps in Bohr’s model. In 1915, Arnold Sommerfeld, a physicist with whom Pauling eventually worked, helped to devise what came to be known as the Sommerfeld-Wilson quantization rules. These guidelines provided an explanation for angular momentum by describing electron orbits as ellipses rather than perfect circles. At the same time, Werner Heisenberg, Erwin Schrödinger and Max Planck (among others) were rapidly embracing a new way to look at physics, expanding the theory and mathematics behind involved in this innovative approach. In 1925, a year before Pauling began an influential trip to Europe, Heisenberg had authored his “Quantum Theoretical Reinterpretation of Kinematic and Mechanical Relations,” which many point to as the true beginning of quantum mechanics. Schrödinger then completed his wave function in 1926. By contrast, the Lewis and Langmuir models were part of an old system that – as soon Pauling discovered – was in the process of being discarded. Linus Pauling at the Temple of Neptune, Paestum, Italy, during his legendary Guggenheim trip to Europe. This photo was taken by Ava Helen in April 1926. I think that it is very interesting that one can see the [psi] functions of Schrödinger’s wave mechanics by means of the X-ray study of crystals. This work should be continued experimentally. I believe that much information regarding the nature of the chemical bond will result from it. These thoughts proved prophetic, as we will see in part 2 of this series. Pauling returned to Pasadena in the fall of 1927, bursting with new ideas. While he was away, Caltech chemistry chief A.A. Noyes had sent word that a unique position had been created for his promising young faculty member, one that lined up nicely with Pauling’s new interests. Upon his re-arrival at Caltech, Pauling was to begin working under the title of Assistant Professor of Theoretical Chemistry and Mathematical Physics. Although Noyes eventually dropped the physics course from the appointment, Pauling liked the idea of hybridizing his interests into one name. It was at that point that he began referring to himself as a quantum chemist. – Warren Weaver to Linus Pauling, December 27, 1934. It is obvious from much of his scientific work that Linus Pauling possessed a brilliant and uncanny ability to think across and between disciplines. Pauling was also a pragmatic and often business-like researcher who understood the necessity of securing financial support for his projects. The long and fruitful relationship Pauling maintained with the Rockefeller Foundation – and, in particular, a Rockefeller administrator named Warren Weaver – made possible much of Pauling’s most groundbreaking work on hemoglobin and structural chemistry. The full force of this intellectually-fruitful relationship reveals both the importance of interdisciplinarity in scientific work as well as the essential nature of active and timely funding. Pauling received his first grant from the Rockefeller Foundation in 1932 for a program of research in structural chemistry. Shortly thereafter, in the fall of 1933, Pauling applied for and later received a three-year grant from the Foundation to support his experimental researches. Pauling’s proposal was bolstered by his recent work in electron and X-ray diffraction, and held great promise of continued theoretical development in the study of the electronic structures of molecules. In 1934 Pauling received more funding from the Rockefeller Foundation, this time in support of his hemoglobin research. He proposed to study hemoglobin in part because he understood that a great deal of general interest lay in the biomedical application of theoretical chemistry. And so it was, more or less, that Pauling’s hemoglobin work received Rockefeller support on the order of $70,000 per year circa 1940. I do not know any one who is so keenly interested in the development of the field of science involving the applications of chemistry and physics to borderline problems of biology, and especially of genetics, and who has such a penetrating understanding of the work which has been done. I find that every conversation which I have with Dr. Mirsky gives me some valuable idea. He has a masterly ability to coordinate results into a significant whole. Indeed, over the years Pauling gave a number of lectures at the Rockefeller Institute and continued to benefit from a wide array of academic and personal relationships that began with the Foundation. The Foundation also continued to fund Pauling’s work well into the 1950s, contributing mightily to the “big science” phenomenon that helped define academic research following World War II. The Rockefeller Foundation was pioneering in its recognition of the importance of supporting interdisciplinary work; in particular, it actively sought to foster research between biology and chemistry. In many ways, Pauling with the prototype scientist that the Foundation was looking to support. Looking back, few can deny the impact that this partnership made on the history of twentieth century science. For more information on Pauling’s relationship with the Rockefeller Foundation, see the website It’s in the Blood! A Documentary History of Linus Pauling, Hemoglobin, Sickle Cell Anemia. We also strongly recommend the book The Molecular Vision of Life: Caltech, the Rockefeller Foundation, and the Rise of the New Biology (1993), written by the late Dr. Lily Kay. 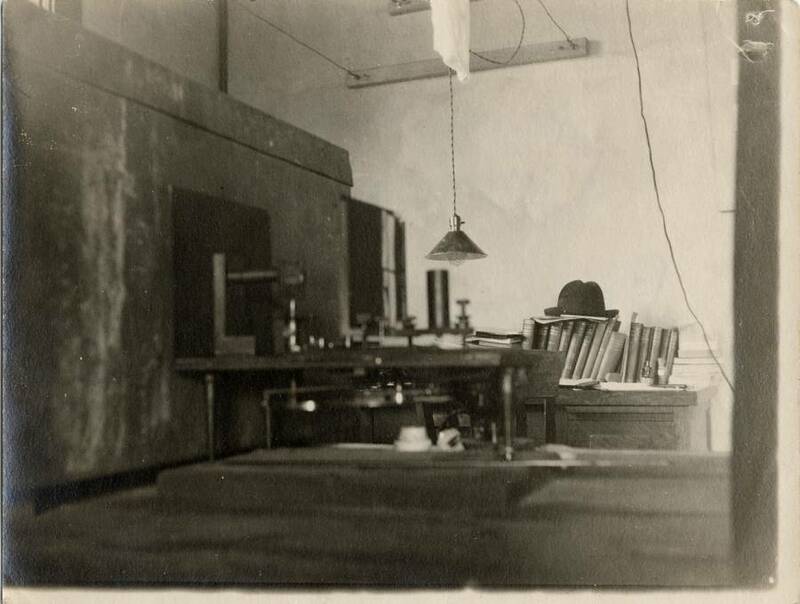 X-ray apparatus at Linus Pauling's desk, Gates Laboratory, California Institute of Technology. 1925. The young Pauling obviously reveled in the excitement of being able to use a new and powerful technology. “We have a pretty extensive collection of apparatus” he once wrote to William Lawrence Bragg, the senior author of a 1922 textbook that started Pauling on X-ray crystallographic research. Any one of Bragg’s student’s, Pauling remarked, “no matter how physical his training,” need not “be frightened at coming to a chemical laboratory” so well-stocked with mechanical apparatus. Initially Pauling used the technique of X-ray diffraction to determine the structures of fairly simple inorganic compounds, but later, as his own expertise grew and as he discovered new sources of funding, Pauling oriented this new technology toward complex organic compounds, including hemoglobin. What was ultimately important to Pauling was not what X-ray crystallography could tell him about the size, structure, or relative placement of atoms within a molecule, but rather, what broader theories that information could then be used to support. His growing allegiance to structural chemistry, his developing ideas about the nature of the chemical bond, and his still nascent interest in biochemical interaction were all fed by his experience of rigorously determining molecular structure through new technological methods. 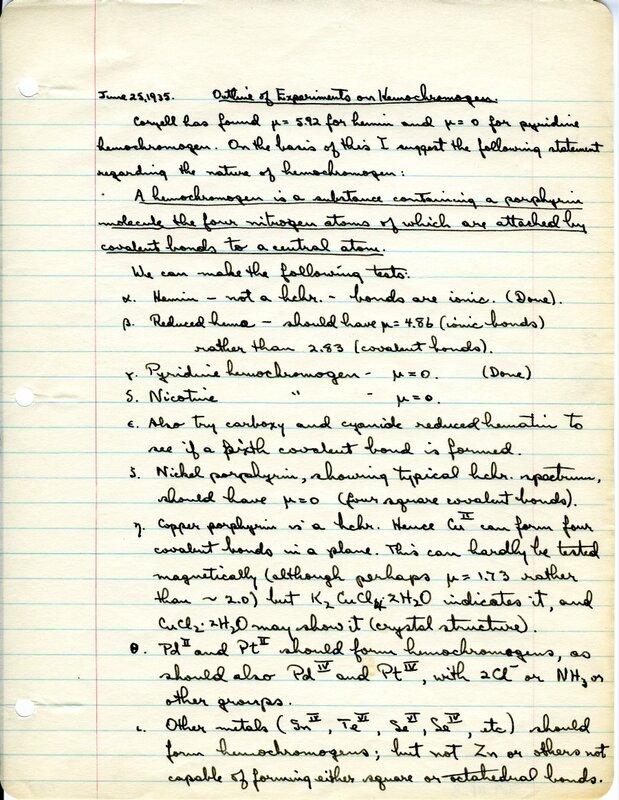 Pauling’s manuscript notes concerning his early experiments with hemochromogen, for instance, indicate the wide spectrum of experimental results he had to assimilate in order to create a coherent picture of the hemoglobin molecule. The difficulties presented by the need to combine the information he had obtained from x-diffraction with information from other kinds of experimentation, including solubility and more traditional experimental methods, are readily apparent in Pauling’s notes. Indeed, the impressive new technology of X-ray crystallography is relegated to just one entry in a list of experimental results. Ultimately it wasn’t the technology at Pauling’s disposal that helped him become such a successful researcher, but rather his attitude in approaching technology and his ability to use the results it gave him to construct more broadly-applicable and intellectually-powerful theories. To learn more about Linus Pauling’s use of x-ray crystallography, see the websites Linus Pauling and the Nature of the Chemical Bond: A Documentary History and It’s in the Blood! A Documentary History of Linus Pauling, Hemoglobin and Sickle Cell Anemia. 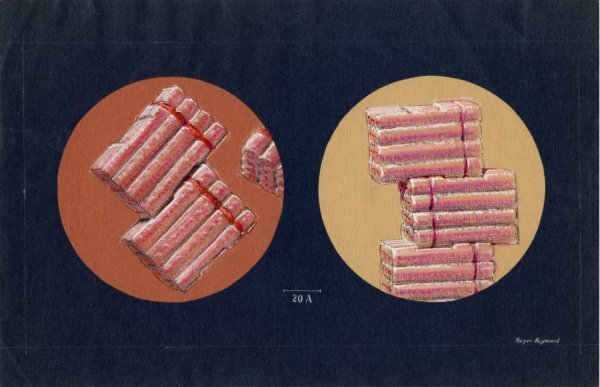 Pastel drawing of Hemoglobin at 20 angstroms, 1964. Drawing by Roger Hayward. – Ted Goertzel. “Linus Pauling: The Scientist as Crusader.” Antioch Review, 38 (1980): 371-382. 1980. Two of Linus Pauling’s greatest scientific discoveries, his work on the nature of the chemical bond and the discovery of molecular disease, both hinged on his distinctly structural approach to scientific problems. Having written a doctoral dissertation on the determination of the molecular structure of inorganic compounds in crystalline state, Pauling chose hemoglobin as an object of study in part because he knew that it was hemoglobin’s changing structure that allowed it to carry oxygen to the tissues of the body. While Pauling like to joke that he chose to work on blood because it was easy to obtain, the intellectual challenge of explaining the sigmoid curve of oxygen saturation in hemoglobin profoundly sparked Pauling’s scientific interest. Later, upon learning about the disease sickle-cell anemia, Pauling came to recognize that the potentially molecular and structural basis of the disease could facilitate a deeper investigation into structural studies of the molecule. Hemoglobin, in part because of its association with the bonding and transport of iron atoms, demonstrated extremely changeable magnetic charges and suggested, even from a preliminary acquaintance, the importance of structural changes in chemical function. At this time I have analyzed the oxygen equilibrium data to make plausible the idea that in hemoglobin the four hemes are arranged at the corners of a square on one side of the globin, being interconnected along the edges of the square, and that in the hemochromogens the hemes are independent of one another; and I have outlined a general program of investigation, consisting mainly of magnetic studies and x-ray studies (anomalous dispersion, radial distribution about iron atoms). In a way, Pauling had always been thinking structurally about the nature of the hemoglobin molecule, its ability to bind oxygen molecules and, later, its particular pathology in the case of sickle-cell anemia. This lecture, entitled “Hemoglobin and Magnetism,” addressed the “new branch of chemistry, modern structural chemistry” through a discussion of some of Pauling’s most recent work on hemoglobin’s magnetic properties. Walter Heitler, Fritz London, and Ava Helen Pauling in Europe. 1926. “The paper of Heitler and London on H2 for the first time seemed to provide a basic understanding, which could be extended to other molecules. Linus Pauling at the California Institute of Technology in Pasadena soon used the valence bond method. . . . As a master salesman and showman, Linus persuaded chemists all over the world to think of typical molecular structures in terms of the valence bond method.” – Robert Mulliken. Life of a Scientist, pp. 60-61. 1989. After Linus Pauling’s publication of “The Theoretical Prediction of the Physical Properties of Many-Electron Atoms and Ions,” he was ready for an even greater challenge – the problem of the chemical bond was a tantalizing enigma for Pauling, and he wanted more time in Europe to work on it. In the winter of 1926, he applied for an extension of his Guggenheim fellowship and with the help of a particularly complementary cover letter from Arnold Sommerfeld, Pauling was granted six more months of support. Pauling did, however, did make one valuable discovery in Denmark — that of a young Dutch physicist named Samuel Goudsmit. The two men quickly became friends and began discussing the potential translation of Goudsmit’s doctoral thesis from German to English. Their work did eventually get them noticed by Bohr, who finally granted Pauling and Goudsmit an audience. Unfortunately for the pair, Bohr was neither engaging nor encouraging. Nevertheless, the two continued to work together, their cooperation eventually culminating in a 1930 text, The Structure of Line Spectra, the first book-form publication for either scientist. In 1926 though, frustrated by his unproductive time in Copenhagen, Pauling departed, stopping briefly at Max Born’s institute in Göttingen before traveling to Zurich where other advances in quantum mechanics promised an interesting stay. Unfortunately, the man Pauling was most interested in, Erwin Schrödinger, proved to be just as unavailable as Bohr. The quantum mechanics revolution was consuming the time and thoughts of Europe’s leading physicists and Pauling, a small-fry American researcher, simply wasn’t important enough to attract the interest of men like Bohr and Schrödinger. As a result, Pauling chose to converse and work with men of his own status in the scientific community. Fritz London and Walter Heitler, acquaintances of the Paulings, had spent the past several months working on the application of wave mechanics to the study of electron-pair bonding. Pauling used his time in Zurich to experiment with the Heitler-London work. While he didn’t produce a paper during his stay, the new model made a great impression on him and he returned to Caltech with a renewed sense of purpose. He was preparing to tackle the problem of atomic structure, in all its manifestations, and make history as one of the greatest minds of the twentieth century. 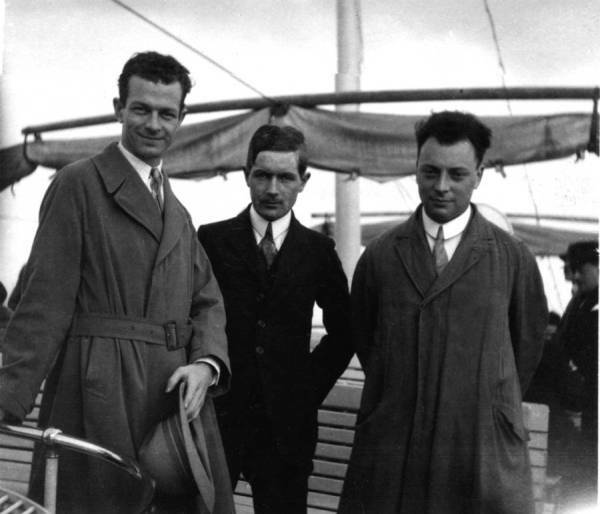 Linus Pauling, Werner Kuhn, and Wolfgang Pauli traveling by boat in Europe. 1926. – Linus Pauling. The Chemical Bond: Structure of Dynamics, Ahmed Zewail, ed. 1992. After his and Ava Helen’s stay in Italy, Linus Pauling was itching to return to the lab. The couple arrived in Munich in the last week of April and the first item on Pauling’s agenda was a meeting with Arnold Sommerfeld. Sommerfeld, in association with Niels Bohr, was responsible for the Bohr-Sommerfeld model of the atom, a precursor to modern quantum mechanical ideas on atomic structure. At the time of Pauling’s European trip, Sommerfeld was serving as the director of the Institute of Theoretical Physics in Munich. He had spent the past decade building Germany’s community of physicists, nuturing many of Europe’s best scientists on a steady diet of cutting edge research. His lectures, famous by the time Pauling reached Europe, were known for their new and innovative content. As Thomas Hager, a Pauling biographer, explains, “[Sommerfeld] knew everyone in theoretical physics, had collaborated with many of them and corresponded regularly with the rest.” He knew exactly what was happening in his field and made sure his students did too. Pauling’s first Munich meeting with Sommerfeld was something of a disappointment for the young scientist. Rather than being allowed to continue the work he had begun at Caltech, Sommerfeld chose to assign Pauling mathematical research relating to electron spin – an area that held little interest for him. After a spell of half-hearted devotion to the electron spin problem, Pauling convinced Sommerfeld to allow him to study the motion of polar molecules. Pauling believed he could clarify portions of the Bohr-Sommerfeld model by introducing the effects of a magnetic field to the existing equations. This caught Sommerfeld’s attention and Pauling was subsequently instructed to continue his research under the stipulation that he provide Sommerfeld with the details of his work for presentation at an upcoming conference in Zurich. Pauling did so, and a few days after Sommerfeld had departed for the conference, he received an order to appear in Zurich to discuss his work. Once at the conference, Pauling found himself surrounded by the leading physicists of Europe. Wolfgang Pauli, a young German physicist famous for his development of the revolutionary Pauli Exclusion Principle, was among those in attendance. On a whim, Pauling approached his colleague and began explaining his recent work on the Bohr-Sommerfeld model. Pauli was unimpressed. The paradox-riddled Bohr-Sommerfeld model, and Pauling’s work supporting it, was on its way out with the new ideas of quantum mechanics soon to take its place. Pauling’s research was too late to be of any value and Pauli was not shy about telling him so. After finishing his summer vacationing with Ava Helen in Switzerland, Pauling returned to Munich for the fall semester. It was at this time that Pauling really began to prove himself, developing a reputation for his extensive knowledge and concentrated enthusiasm. Pauling’s most important accomplishment, however, was not his ability to make friends. Instead, it was gaining both the attention and the esteem of Arnold Sommerfeld. Pauling did so by discovering a mathematical error in the work of Gregor Wentzel, a protégé of Sommerfeld. The discovery and correction of this mistake garnered Pauling a great deal of respect in Sommerfeld’s eyes. In a matter of months, Pauling had evolved from a star-struck young American to a legitimate player in the European field of quantum mechanics. Fortunately for him, his rise to scientific prominence had only just begun.